Arguably, there is nothing better than having a pet. Sharing a home with an animal, who, despite the fact you don't speak the same language, nor even necessarily understand them all the time, is your best friend. The love between pets and their owners is completely pure. There are no complex human emotions involved, it's nothing but love. Thus, it's obvious that having a pet is considerably easier than having a human relationship. People will do anything for their pets. Anything to keep their pet healthy, happy and safe. Which is exactly what this family had to do when their adopted kitten was sick. 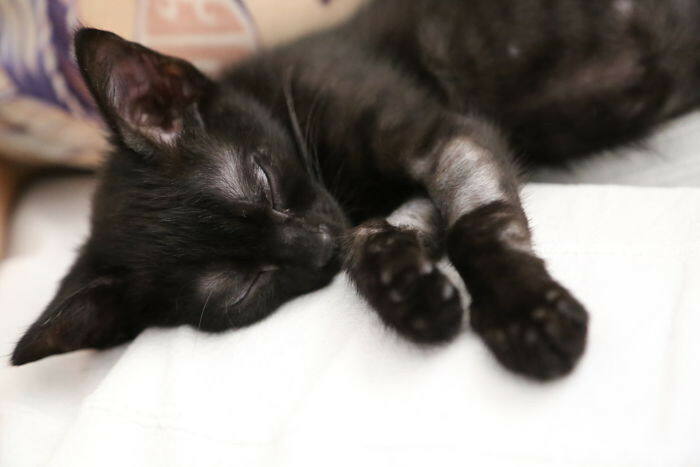 Shuri was named because her new parents had just watched Marvel's Black Panther and they wanted a nice, strong female name for their new kitten. Little did they know how appropriate the title of Warrior Princess would be. This is one of the first pictures of Shuri. Simona Serban finally decided it was time to adopt a cat. She managed to convince her husband and they started to look for a kitten. Simona wanted a black cat. 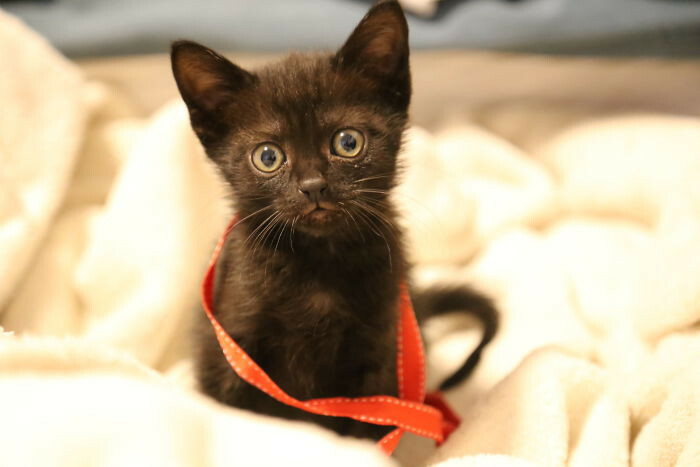 Black cats are often the last to be adopted because they're still seen as being unlucky. 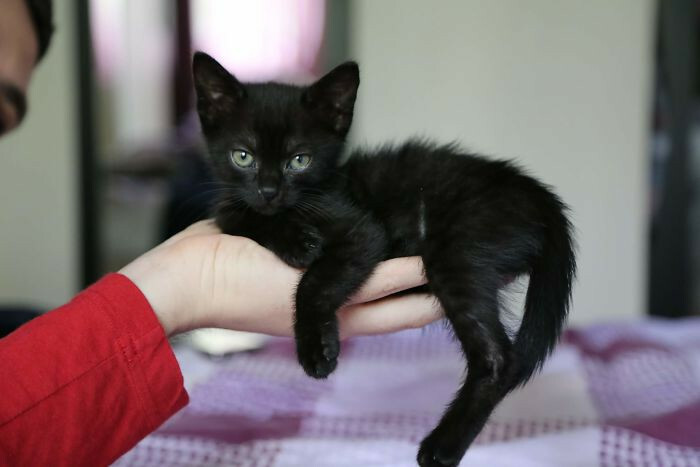 They found an ad online that was advertising the last black kitten from its litter. They knew that was exactly what they were looking for. After having her for a day, they decided to take her to the vet to make sure Shuri was okay. The vet discovered Shuri had a fever. Shuri was given injections to try and treat the cause and lower her fever. This was just the beginning of Shuri's health problems. Two week later, Shuri was hospitalised because her fever increase and her eyes and nose became badly infected. She was diagnosed with Feline Herpesvirus infection or Feline Viral Rhinotracheitis. The vets guessed she got the inflection either when she was born, or not long after from one of the other cats in the litter or her mother. Shuri was very fragile and weak; she had to be given an IV. Whilst at the vet, they found some other problems. Shuri had a fungus on her skin which was causing hair-loss. Shuri's parents also got infected with this fungus, so they were all under treatment! Three months later, the treatments were complete. In amongst visits to the vet and dermatologist, countless medicines and a few scares, they thought Shuri was finally happy and healthy. When Shuri was about six months old, her parents noticed some unusual blood spots on the poor cat's ears and eyes. So back to the vet they went. Blood tests revealed that Shuri was diagnosed with Immune Mediated Thrombocytopenia. This condition occurs when the immune system attacks and destroys blood platelets. If Shuri had've had a severe accident, such as a fall or blow, she could've bled out. She had surgery and was treated for six months. The treatment affected her immune system, and Shuri came down with the fungus again. Shuri is now one year old and fungus free! Shuri is about half the size of a regular full-grown adult cat. She stopped growing at about 6 months old. Her parents suspect this is because of all her treatments and problems. She now weighs around 2.6 kilograms (5.7 pounds). Shuri is now a very happy and playful cat! What's more: she loves cuddles! Her parents love to dress her up! After a year of health problems, Shuri is finally enjoying her life as she was meant to! Proving that even black cats can overcome being unlucky!